The Elizabeth Duck is a rare breed of domesticated waterfowls that was developed in the continent of Australia. Though they are raised mostly for their tasty meat, they have been classed as ‘Ornamental Domestics’ in Australia. These small, stocky birds are known for their good temperament, and needs very little space to be reared. In 1972, this new breed of ducks was developed in the Merrylands region in New South Wales in Australia. 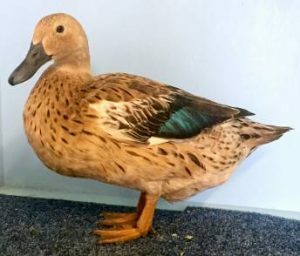 A man named Lance Ruting crossed two duck breeds – the Mallard and the Rouen Claire ducks and produced this new breed with an objective to make a water fowl that would grow quickly to yield good quality meat. The breed has been declared as ‘endangered’ by the Rare Breeds Trust of Australia. 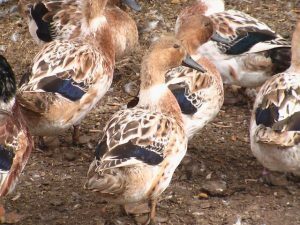 The Elizabeth Ducks are not available in the wild, but as pets only in poultry farms. At present, this breed is reared only in New Zealand and Australia. Coffee/Brownish coloration: Those that have blue wing tips. Both the two varieties have bluish-grey bills. Reared mostly for their meat, they are known as tender and tasty table bird. 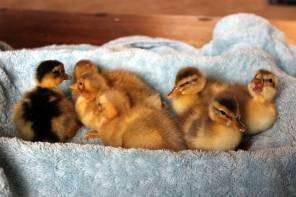 Ducklings can reach the age of slaughter very quickly, and can yield anything between 2¾ to 4 lbs of meat. 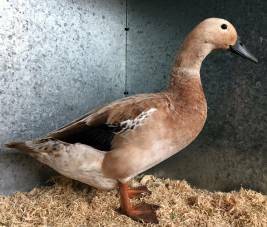 The creator of this breed named the waterfowl after his wife Ann Elizabeth Ruting.